Josh Blue started doing comedy during his college days. He was the winner on the 2006 season of NBC's Last Comic Standing and was the first comedian to do stand-up on The Ellen DeGeneres Show. Blue has cerebral palsy, specifically classified as spastic hemiplegic cerebral palsy. His condition has not stopped him from a successful career in comedy and it is sometimes used as comedic material for him. My sister Jean saw him earlier this year and sent me the picture. That's Jean, always looking out for me and contributing. It's reason #834 of why I love and appreciate her. I checked out some of Blue's work on YouTube. One appearance on Last Comic Standing, an appearance on The Tonight Show and another appearance on Last Comic Standing are just a few of the videos I found and enjoyed. You can also go to JoshBlue.com for more info and other fun. Blue is an inspiration to all. He is not letting his condition prevent him from living his dream as a comedian. Going up on stage and doing stand-up has to be hard enough, without the added hindrances his condition brings him. I have not called him a "disabled comedian," because, first and foremost, he really is just a comedian, who happens to have a life-altering medical condition. 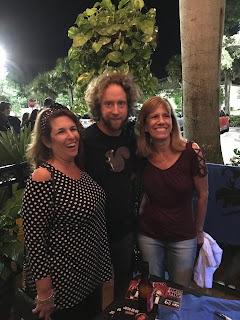 A friend, Josh Blue and Jean Parker in Florida-Spring 2018. Great comedian .... great article! !